I am shocked by this. SHOCKED. If you had asked me which of my kids would love preschool and which would hate it, I would tell you that Alice would love it, and Tom would hate it. And you would think I don’t know my kids at all because the exact opposite is true. Tom loves it. LOVES. Even though sometimes participating in the activities is hard for Tom to do (he thinks he has better ideas!) — he truly loves it. He loves his teachers, friends and activities. He’s just doing great. The first couple days were fine. But then they had this week-long fall break two weeks after school started, and it’s been downhill since then. Her teachers are the same teachers Tom had for twos, so I know them pretty well. And they know Alice pretty well because she has grown up in front of their eyes these past couple years. Here’s the deal: Alice loves the crafts and activities. What she doesn’t like is downtime. Or free play. She doesn’t like that at all. As soon as there is any type of break (like while the teachers set up for the next activity) she cries for me. One day, her teacher made a deal with her — if she wouldn’t cry until lunch, she could get a sticker, and then she could cry. Alice took that deal. But didn’t cry at lunch because her teacher made that deal with her throughout the day and it worked! So I felt like that was promising. But it wasn’t, because after that day she was onto it and didn’t care about stickers or quietness so…boo. Now she’s been steadily getting worse. Thursday she cried so much and so long, they actually had to move her to the director’s office so she could color in there by herself (with the director, of course) because her crying for her mom makes the other kids cry for their moms. But if you ask her if she likes the crafts, her teachers, or her friends, she’ll say yes. Now — Alice does not need to go to preschool this year. She’s two. It’s okay if she doesn’t go. I don’t need her to go or anything, and I love having her home. We only enrolled her because she’s been begging to go and we thought she would love it. What I’m saying is — I don’t mind pulling her out. Maybe she’s just not ready to be away from me, and that’s totally okay with me. But the reason I haven’t pulled her out yet is because I was waiting to see if we consistently sent her (without a fall break, or a sickness kept her out one day) — if she would improve. And I’m a little worried that if I pull her out this year, we’ll have to go through all of this again next year. But I really don’t want her to hate preschool! There’s nothing to hate! It’s a fun, little school. A short day. With all the things she loves! But if she doesn’t love it, I don’t want to send her. So that’s where we are. I’m pretty much ready to call it. Kevin wants to give it another week, which I understand. And even if we take Alice out, she’ll still be with me at every school event because I’m Tom’s room mom and the co-chair of the Parent Council (super room mom!) so…she’ll be there. She just won’t be there. We shall see. Maybe this week will be different and she’ll be fine. Or…maybe she’ll be a 2-year-old-preschool-dropout. Either way, I know for a fact, she’ll be awesome. 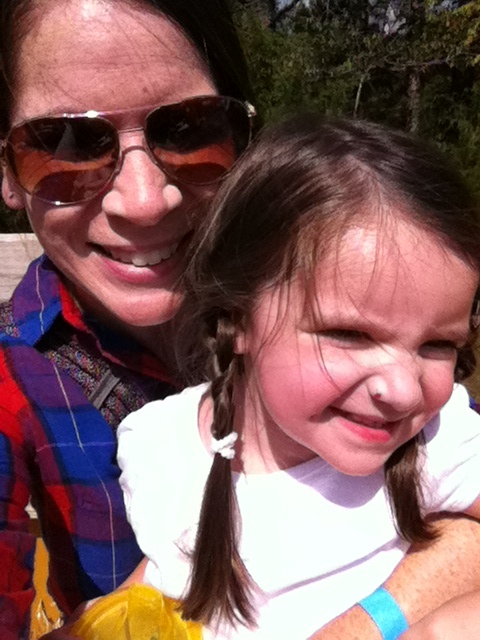 7 Responses to NOT Loving Preschool. It is totally a thing! And you’d be a great homeschool mom — for preschool or further onward! Ack..my learning notes…I am not superwoman. I am Crazy Woman and I must be stopped. I am driving us all bonkers. Gotta tweak our schedule before we all go run off a cliff. So don’t let my craziness influence you negatively about homeschool. Please. I’m happy for you and sweet Alice to be home together. Enjoy it! awww poor Alice! I would have guessed that she would have loved it too. She just wants more crafts!! Ha. You can totally home preschool her. For sure. She’s home! Today was her first day home from school and I think she loved it. Walks with friends and crafts — all WITH MOM. She was thrilled. I know! I took her out. The preschool director said I could try again after Christmas, but I’m kinda thinking I won’t. We’ll just stick with home this year, and hopefully she’ll be sick of me by next year. 🙂 LOVE!